The best VPNs for Fire Stick and Fire TV come with fast speeds, great privacy features, and simple design. Their apps work seamlessly with Amazon Fire Stick, Fire TV, and Fire Cube, and are available in the Fire OS app store. Whether you want to use your Fire Stick for Kodi, torrenting, or streaming channels like Netflix, we've got you covered. The Amazon Fire TV and Fire TV Stick are great portable, plug-and-play devices that make it easy to stream your favorite media on your television. It gives you on-demand access to thousands of hours of video from Amazon Prime, Netflix, Hulu, and more. The Android-based Fire TV operating system is also a favorite among Kodi users. Unfortunately, much of that content is geo-locked, meaning you can’t access channels on the Firestick while abroad. Video libraries are limited due to content licensing agreements, and local sporting events are blacked out due to exclusive broadcast rights. Kodi users streaming from popular add-ons might need a way to hide their activity from their internet service provider. The solution to all of these issues is to add a VPN to Fire Stick. 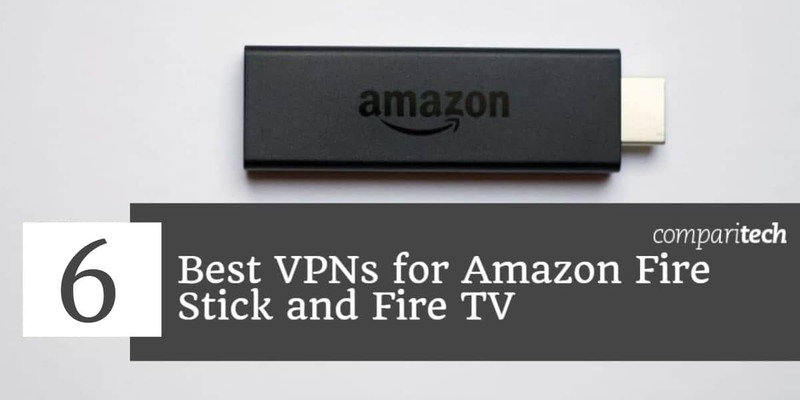 Short for virtual private network, a VPN service encrypts the Fire TV’s internet connection and routes it through an intermediary server in a location of the user’s choosing. This can change your IP address, and thus your perceived location, to access geo-locked content from Canada, the UK, Australia, or anywhere else in the world. The encryption vastly improves your privacy and masks your activity from snooping ISPs. IPVanish Top choice for Kodi and Amazon Fire TV Stick users. Lightweight, remote-control friendly. Strong security and decent speed. 30-day money back guarantee. ExpressVPN Fast with solid security, plus it can unblock tons of streaming sites like Netflix. CyberGhost Budget option. Unblocks major streaming sites with no compromises on security and fast servers. NordVPN Leading security and privacy features. Streams video with good speeds and quality. PrivateVPN Newest service on this list with fast servers that are good for streaming. Windscribe Has dedicated Fire Stick app, decent speeds. Note that not every VPN service on this list can unblock Amazon Prime Video from abroad. We’ve got a separate article for Amazon Prime VPNs, some of which also appear on this list. IPVanish VPN is a favorite among Kodi users, and for good reason. It offers unlimited bandwidth and data for HD video streaming. Strong encryption and a no-logging policy hide your activity from your internet service provider. IPVanish has a huge network of servers around the world, so unblocking content shouldn’t be a problem as long as VPN connections aren’t blocked. Subscribers can connect up to five simultaneous devices. The app interface is particularly well-suited for Fire TV and can be used with the Fire TV remote. IPVanish has created an app specifically for Firestick, which is now available directly from Amazon’s official app store on your Fire TV. Just search for IPVanish and it will pop up. The app is fully compatible with your remote control and very easy to use. BEST VPN FOR FIRE TV STICK:IPVanish is our top choice. Has an app designed specifically for use with the Fire TV or Fire Stick. Own network of super-fast servers and score top marks for privacy and security. A favorite with Kodi users and torrenters. 7-day money back guarantee. ExpressVPN boasts the highest standards when it comes to speed and security. It has servers in over 90 countries and is one of the few VPNs capable of unblocking American Netflix and Hulu from outside the US. Recently, ExpressVPN created a version of its app specifically for Fire TV, which is now available through the official app store on your Firestick. You can easily install it and control the VPN with your stock remote control. If you have a first-generation Fire TV Stick and want to set up ExpressVPN on your wifi router, ExpressVPN makes custom router firmware you can flash to certain router models, or you can purchase a pre-configured router directly from the company. ExpressVPN subscriptions also come with a smart DNS proxy solution called MediaStreamer, which you can also use to unblock geo-locked content. MediaStreamer can be set up in the Fire TV’s settings without the need to install an app. GREAT ALL-ROUNDER:ExpressVPN holds its own .A fast and reliable choice which confidently unblocks all major streaming services with ease including Netflix, Hulu, Amzon Prime, BBC and others. Comes with a Fire TV specific app. Great privacy features and keeps no logs. One of the few VPNs to work in China and UAE. Try it risk-free with the 30-day money back guarantee. CyberGhost has just put out the Fire TV version of its app, which you can find and download via the search function on your Firestick or Fire TV Cube. Cyberghost allows you to choose a server according to the streaming service you want to unblock, rather than forcing you to choose a location and hope for the best. This makes it extremely easy to unblock Netflix, BBC iPlayer, and many more. Get the Cyberghost App on Amazon. Speeds are great–plenty fast enough for you to stream high-quality video without buffering. CyberGhost has excellent security policies and practices and adheres to a no-logs policy. It operates thousands of servers in more than 60 countries. Apps are also available for Windows, MacOS, iOS, and Android. BUDGET CHOICE:CyberGhost is great for beginners. A budget choice that works well with Amazon Fire Stick and provide a Fire TV version of its app. Stores no internet activity logs and stream HD video reliably. Can struggle with unblocking some popular streaming sites. 45-day money back guarantee. NordVPN recently released an official Fire TV app, so you can download it right from Amazon on the Firestick or the Fire TV Cube. Just search for NordVPN and it should be the first option. NordVPN has servers optimized for ultra-fast streaming and can unblock US Netflix and Hulu from the Android app. The Panama-based provider holds to a true zero-logs policy and maintains strong security standards. A single subscription nets you six simultaneous connections. Tutorials for a wide range of router firmware are available on its website as well. The NordVPN Android APK is available here (direct download link). GREAT VALUE:NordVPN is a solid all-rounder. Works well with Amazon Fire TV Stick and has a compatible app. Solid security and privacy performer. Some servers can be unreliable and you can’t specify servers. Includes a 30-day money back guarantee. PrivateVPN recently launched a Fire TV version of its app, which you can download and install directly from the official Amazon app store on your Firestick with no workarounds or hacks. PrivateVPN, not to be confused with Private Internet Access, is a fresh up-and-comer in the VPN industry. While it has a smaller VPN server network than the other options on this list, it performs just as well when it comes to unblocking geo-locked content like Netflix, Hulu, Amazon Prime Video, and BBC iPlayer. PrivateVPN also uses encryption standards on par with its veteran counterparts. It boasts a no-logging policy and allows up to six simultaneous connections. GOOD SPEEDS:PrivateVPN is a good family choice. Comes with a specific Fire TV version of the app. Good for HD Streaming. Allows up to 6 devices on the same account. Could do with having more servers and lacks 24/7 support. 30-day money back guarantee. Windscribe makes a dedicated app for Firestick users available on the Fire TV app store. It’s super easy to install without tweaking any settings and doesn’t require any third-party apps to control. A Windscribe subscription nets you fast speeds, unlimited simultaneous connections, and strong security. It unblocks US Netflix as well as a handful of other streaming video sites from abroad. Windscribe works in China and allows torrenting. It keeps no logs of user activity. In addition to Fire TV, apps are available for Windows, MacOS, iOS, Android, along with browser extensions for Chrome, Firefox, and Opera. ABLE CONTENDER:Windscribe hits good speeds. Has a dedicated app for Firestick. Above standard for security and privacy. Lacks true 24/7 support. 3-day money back guarantee. If your VPN provider makes its app available on the Amazon Fire TV app store, getting set up is easy. Just sign up, install, sign in, and connect. In our list, ExpressVPN, IPVanish, PrivateVPN, NordVPN, CyberGhost, and Windscribe all make great Firestick VPN apps. Most VPNs, however, don’t have apps on Amazon’s Fire TV app store. Adding a VPN to an Amazon Fire Stick from a third-party source isn’t hard, but it is a bit trickier than installing one on a desktop, laptop, or smartphone. Because Fire TV doesn’t have access to Google Play, you’ll have to manually download the Android app APK file or sideload the app from another Google Play-connected Android device. We’ve got detailed instructions for several different solutions in our Amazon Fire TV VPN setup guide, as well as a Fire TV Kodi setup tutorial. Note that the first-edition Fire TV Stick is not compatible with VPN apps. If you’re using this older version, the VPN will have to configured on your wifi router instead of on the device itself. Alternatively, you can connect to the VPN on your Android smartphone and cast streaming video to your Fire Stick. Fire TV and 2nd generation Fire TV Sticks and later should all support VPN apps. Some VPN apps don’t work well with the Fire TV remote and require at least a mouse to use. The obvious solution is to connect a Bluetooth mouse, which is supported by newer versions of the Fire TV and Fire TV Stick. Another option is to use Mouse Toggle, an app available for iOS and Android. Mouse toggle turns your smartphone into a mouse that can be used to control your Fire TV. It costs $2.99, which is cheaper than buying a physical mouse. You will need to enable ADB Debugging in your Fire TV settings. Instructions are included with the app, and you can be up and running in about five minutes. Once you have a VPN enabled on your Fire TV, your newly assigned IP address should allow you to unblock most geographically restricted content. However, certain apps and streaming sources might require a few more steps. Some users, particularly those using their Fire TV devices with a VPN set up on a virtual or physical router, have had issues with changing their location to unblocked geo-locked content. This is possibly due to the Fire TV sending DNS requests outside of the VPN tunnel. The solution is to change your Fire TV’s DNS settings. Check with your VPN provider to see if they have a DNS address you can use. If not, we recommend finding a DNS address for your desired country from OpenNIC. You will need the IP address of your wifi router. This is usually 192.168.0.1 or 192.168.1.1. When you connect to your wifi network for the first time (use the Forget Network function if you’ve connected previously), on the menu where you enter your wifi password, click on Advanced. Under Gateway, enter your router IP address.